Among chefs and researchers in gastronomy there is a growing interest in exploring local waters in order to use resources in a more diverse and sustainable manner, including using the cephalopod population as a counterweight to the dwindling fishing of bonefish, as well as an interest in finding new sources of protein that can replace meat from land animals. "We know that wild fish stocks are threatened and we are finding it difficult to establish new aquaculture because of problems with pollution. At the same time, the global cephalopod population (including squid, octopus and cuttlefish) is growing, which is why we have investigated whether there may be grounds for getting people to eat cephalopods in those parts of the world where there is no widespread tradition for it," says Professor Ole G. Mouritsen from the Department of Food Science at the University of Copenhagen (UCPH FOOD) in Denmark. Together with the chef Klavs Styrbaek, he is the author of the article "Cephalopod Gastronomy – A Promise for the Future", published in the English scientific journal Frontiers in Communication. The article is part of a worldwide study of cephalopod species under the initiative CephsInAction. "The reason for CephsInAction is that we generally lack knowledge about cephalopods. 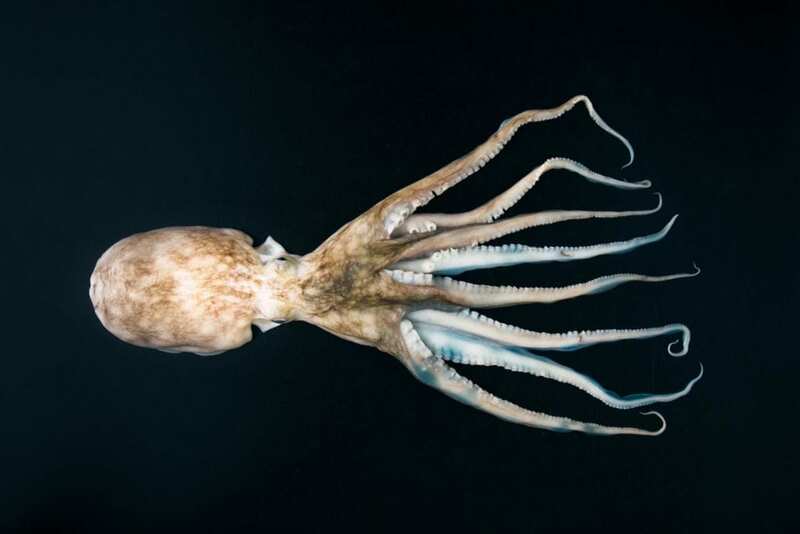 The project includes broad research into cephalopods – some are carrying out research in psychology, while others are conducting research in how to transfer the movement patterns of cephalopods to robots. We have been invited because there is a need to look at how to make use of the cephalopods in food," says Professor Mouritsen. Cephalopods are known for being able to adapt to temperature changes and recent research shows that the global population has been increasing since the 1950s right up to today – possibly due to climate change and diminishing populations of fish predators. Cephalopods usually only live for 2-3 years, some of them growing to 18 metres long. Thus, they are extremely efficient at converting food into muscle, which means they can contribute with healthy proteins to food for human consumption. One challenge, however, is that they are very difficult to breed in aquaculture because young cephalopods require a very special and very costly food. "The growth in the population applies to all species – including those you can eat. Cephalopods are filled with healthy nutrients like proteins, minerals, omega-3 fatty acids and a number of micronutrients, making them an obvious future food resource," says Professor Mouritsen. The taste experience from cephalopods is largely related to the umami flavour (meat flavour) and the texture. Cephalopods are most commonly eaten in Southeast Asia and Southern Europe, whereas it is less common in, for example, North America and Northern Europe, even though the local waters contain many edible cephalopod species. In these regions, you most often meet the cephalopod in the form of battered deep-fried rings, which can be quite tough to chew on. But there are a variety of other cooking techniques: boiling, steaming, frying, grilling, marinating, smoking and drying. "A squid ring may have an aesthetic appeal, but you are cutting down the length of the strongest muscle fibres, which is the worst cut if you want to prepare a delicious and tender dish with cephalopods," says Professor Mouritsen. He encourages the eating of cephalopods for the sake of texture and to avoid preparing them so that they become completely dry or completely soft. "Instead, appreciate that dishes with cephalopods offer a certain mouthfeel and that there should be some resistance in the meat, which should also be creamy – not tough, hard, dry or mealy." "At present we are faced with finding alternative food sources, but it is difficult to get people to eat something they do not like. That is why taste comes first. I believe that cephalopods will become a widespread food around the world if we can succeed in making dishes with cephalopods taste so good that there will also be a commercial market for them. We will eat cephalopods because of the taste experience." Although cephalopods are a traditional part of the food cultures in many parts of the world, there are only a few top chefs and gastronomic entrepreneurs who have been interested in raising them up to Michelin star level. But two things indicate this is changing: Chefs in food cultures where there is no tradition of either fishing or consuming cephalopods are beginning to explore a local cephalopod kitchen; and chefs in countries where there is a long tradition of eating cephalopods have become interested in reinventing the use of cephalopods, for example, by inventing new dishes and using body parts that have previously been regarded as worthless in cooking. FAO (2014) estimates that the total worldwide catch of cephalopods amounts to about 4.8 million tons per year, but the number is uncertain as not all countries report their catches. Although part of the catch is used for bait for other fishing, the vast majority of the catch is used as food for human consumption. The commercially most important cephalopods come from the flying squid family (Ommastrephidae), in particular Illex argentinus, Dosidicus gigas, and Todarodes pacificus. Half of the world's cephalopod catch is Todarodes pacificus (Japanese flying squid) and this squid is possibly the only wild species that has enough potential to contribute significantly to the world supplies of protein. As it stands today, 2% of humans' global consumption of protein is from cephalopods. Every year, 350,000 tons of wild octopuses are caught with a trade value of 1.5 billion USD – most of it is caught in Asia; in particular in Chinese waters. However, there are also opportunities in Northern European and North American waters – but it will require the fishing industry to adapt their fishing methods to catch cephalopods as the main catch. The research is funded by Center grant to Taste for Life.